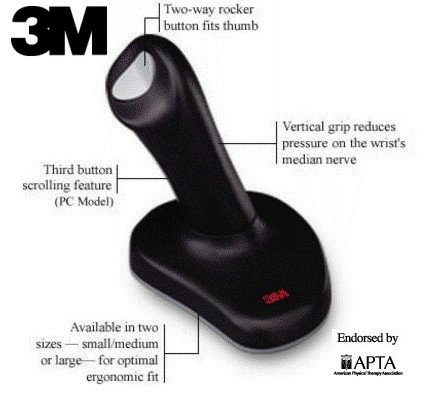 The Ergonomic design of the 3M Vertical mouse keeps the arm positioned for natural, comfortable movement. Clinically proven to reduce muscle strain and discomfort associated with Carpal Tunnel Syndrome and repetitive stress injury. Compatible using any USB port computer. Size large. APTA Endorsed! 3M Ergonomic mouse allows you to work easily and comfortably for hours by keeping the arm positioned for natural, comfortable movement. Clinically proven to reduce muscle strain and discomfort associated with Carpal Tunnel Syndrome and repetitive stress injury. Compatible with PC's, Macintosh, and iMac computers with USB ports. PC's- using WIN 95, 98 and NT4.0, Win 2000, Win 7 and greater. Macintosh/iMac/iBook- using Apple O/S 8.1 or higher. Plug and play, no software required. It looks like a joystick, how does it work? The unit is solid, it doesn't rotate, bend, twist etc. You hold it with your hand and slide the entire unit around on your desk or mouse pad. This keeps your hand in a neutral position and moves your entire forearm instead of flexing just your wrist. It feels a little awkward at first, but once you get the hang of it you'll wonder why you ever moused any other way! Measure hand, from base of palm, (near little finger) to base of index finger.